Neither the R7 260 nor the R7 265 are remarkable as far as voltages are concerned. Both of these are right in the range of common voltages for lower clocked Pitcairn and Bonaire products respectively. 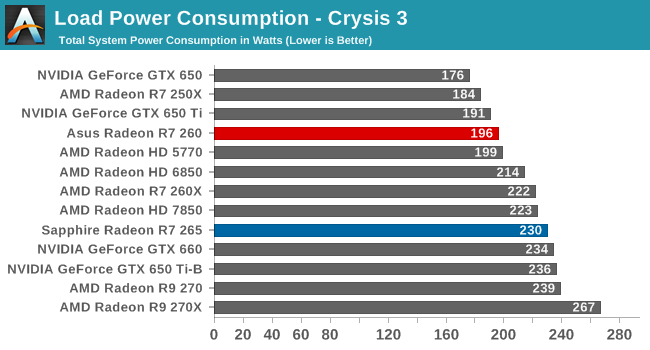 Though this does reinforce the fact that R7 265 won’t see any significant power savings compared to R9 270. Looking briefly at average clockspeeds, despite the fact that these cards implement different power control mechanisms – PowerTune Boost 1.0 and PowerTune Boost 2.0 respectively – the end results are the same. Neither card has difficulty maintaining its top clockspeed for their entire runs, this owing in large part due to the fact that they’re not under any significant thermal load that would require pulling back. Starting as always with idle power consumption, we can see that all of our low-end cards are tightly clustered. With idle power consumption as good as it is for both AMD and NVIDIA, further improvements are relatively marginal by desktop standards and are essentially drowned out by the large PSU in our GPU testbed. 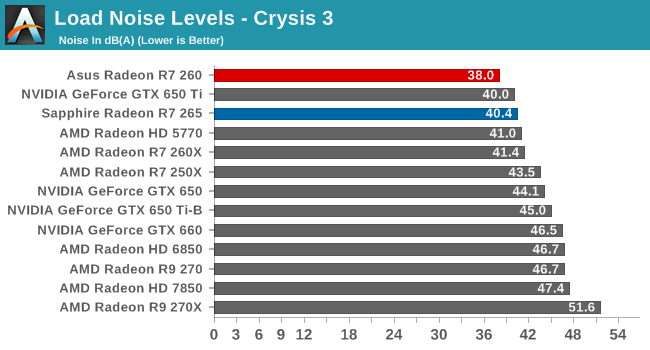 Power consumption under Crysis 3 closely mirrors relative performance, at least for our current-generation 28nm cards. The R7 260 for its part draws 196W at the wall, 15W-23W more than the R7 250X and GTX 650 cards it clearly outclasses, and 5W more than the GTX 650 Ti that it still manages to consistently beat. 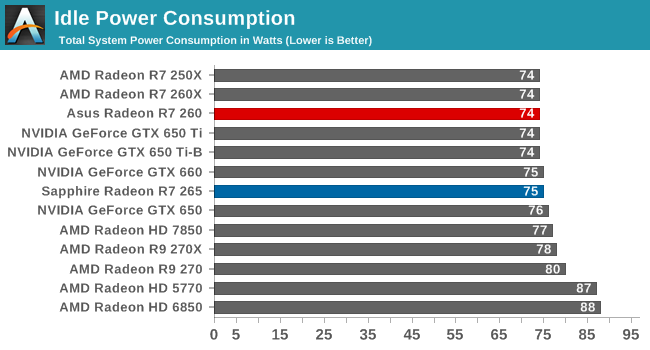 More interesting is that it’s drawing 26W at the wall less than the R7 260X, showcasing that AMD’s power numbers for these cards were in fact almost spot on, especially after accounting for the change in CPU power consumption. 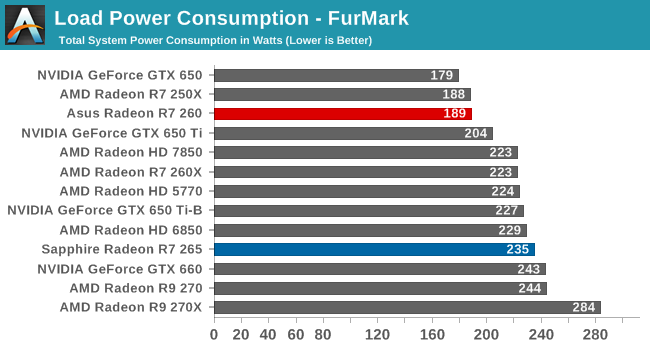 Otherwise for the R7 265, we can see that power consumption slots in above the 7850 and R7 260X, and below the R9 270 by 9W, the kind of very limited change we were expecting. At the same time we can see just how close the R7 265 and GTX 660 are – separated by just 4W – which goes hand-in-hand with their similar performance. Under FurMark we do see some shifts in relative power consumption, though not relative rankings. At 189W the R7 260 is virtually tied with the less powerful 250X, underscoring Bonaire’s greater efficiency and improved power throttling mechanisms, while the 235W R7 265 once again slots in between the R7 260X and R9 270 by several watts in each direction. Moving on to temperatures, our idle temperatures are unremarkable. 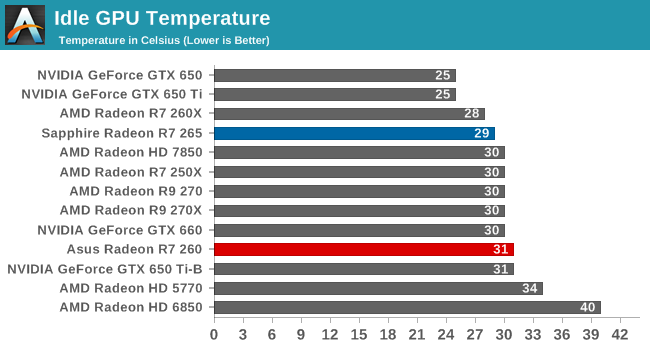 At 29C for the R7 265 and 31C for the R7 260 both cards do well enough, but they can’t touch the near room temperature operating temperatures of some of the NVIDIA 650 cards. With both of today’s cards being low power open air cooled dual fan cards, there’s little concern for temperatures. Both cards are easily below 70C, with the more powerful R7 265 easily dropping to 55C due to its larger cooler. The R7 260 hits 66C despite its relatively low power, though Asus has clearly been targeting a balance between noise and temperatures as opposed to just maximum cooling in their more recent designs. Of our two cards, the R7 265 gets the worse of FurMark relatively speaking, thanks in part to its coarser power throttling mechanisms. Regardless even when presented with a maximum load, both cards do well for themselves here, having no trouble staying below 70C. Last but not least we have our noise testing. Both the R7 260 and R7 265 do very well for themselves at idle, taking the #1 and #2 spots respectively. Both of these cards are functionally near-silent at idle, and this proves that both Asus and Sapphire did their homework by being able to hit these noise levels with a dual fan configuration, something not every vendor has had a ton of luck with over the years. Once again both of today’s cards do very well here. Though the R7 260 is admittedly among the lowest powered cards here, and hence has the easiest time, it nevertheless takes the top spot at 38dB. This being quieter than both the GTX 650 and GTX 650 Ti, the two cards it’s closest to in power consumption and heat generation. Meanwhile at 40.4dB is the R7 265, where Sapphire has managed to stay cool and quiet despite the nearly 150W the card can pull. At this point it’s still marginally quieter than the slower 260X and over 6dB quieter than the performance-competitive GTX 660 (though it should be noted that the GTX 660 is a blower). FurMark once again changes the picture, but only slightly slow. Even under this extreme workload Asus’s R7 260 comes away smiling, topping out at 38.5dB, 2.5dB less than the GTX 650 Ti. Otherwise we have the Sapphire R7 265 at 43.6dB, which gives up some of its edge from earlier but not much, easily besting the GTX 660 and R7 260X, but falling a bit short of the GTX 650 Ti. Taken in altogether, both Asus and Sapphire have done good jobs with their R7 260 and R7 265 respectively. As we’ve seen both are able to hit low noise levels even for their relative classes, all the while easily maintaining low operating temperatures. Otherwise from a power perspective as neither card is based on a new GPU, there are admittedly no real surprises to be had. Power roughly scales with performance, with the R7 265 as a 3rd tier part seeing a lesser benefit, and thereby falling a bit behind the efficiency curve as set by the higher tier Pitcairn parts.